Scotstown withstood a gutsy Burren comeback to advance to the Ulster Club Championship semi final in what proved to be pulsating finish in Pairc Esler. The Monaghan champions were in control for majority of the contest yet almost let the game slip, only for the sprinkling of class their county men provided. 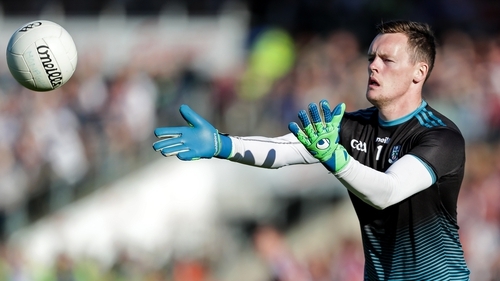 None more so than than recently announced All-Star goalkeeper Rory Beggan. His selection proved a polarising decision during the week, but their was no doubts of his qualities after his display in Newry. Visibly full of confidence, the monaghan net minder comfortably strode up the pitch with purpose on numerous occasions and raised the roof with a point from play, in what was a virtuoso performance. Having been seven points down in the second period, Burren would have like to have tested Beggans penalty saving skills in the dying stages. The Down Champions didn’t get the crucial call when they felt substitute Ryan Treanor was pulled down. Their was only one point between the sides at the time and the margin should never have been so close such was Scotstown’s dominance which was undermined by 13 first half wides alone. The game as a whole failed to ignite as a result of the wastefulness. Monaghan’s Conor McCarthy converted a free he won himself to open the scoring with Francis Maguire quickly adding before Donal O’’Hare opened Burren’s account. Shane Carey nudged Scotstown further ahead, but they still remained in third gear as Eamon Toner found the target from a narrow angle and Cathal Foy levelled entirely against the run of play. Kieran Hughes sprung into action with a sublime long range effort, Beggan from play after a neat one two after a quick free and Carey again gave 6-3 lead at the break. Scotstown manager Kieran Donnelly’s half time team talk did the trick when his side upped the ante in the third quarter with four unanswered scores. Kieran Hughes black card combined with Paddy O’Rourke’s sides ability to hang in the game brought them a county title and nearly bore success again when having looked out of the contest roared back into the game with six scores on the trot. Donal O’Hare’s accuracy from dead balls with four in a row gave them more than belief while Foy and replacement Sean Murdock made it a dramatic one point game. Scotstown dug deep with late counter-attacking points from Carey and Donal Morgan to make sure they play Derry Champions Eoghan Rua in two weeks time. Scotstown: Rory Beggan (0-2, 0-01f), Damien McArdle, Emmet Caulfield, Jack McDevitt; Ryan O’Toole, Donal Morgan (0-01), Brendan Boylan;Frank Caulfield, Darren Hughes; Jamie McCarey, Kieran Hughes (0-02), Shane Carey (0-05, 2f); Francis Maguire (0-02), Conor McCarthy (0-01, 0-01f), Orin Heaphey. Subs used: Ross McKenna for O Heaphey (HT),Paul Sherlock for K Hughes BC (45), Dermot McCrudden for F Maguire (56), Micheál McCarville for B Boylan (62). Burren: Cathal Murdock; Steven Fegan, Kevin McKernan, Ardan McEvoy; Conaill McGovern,Shay McArdle, Conor Cox; Declan Rooney, Conor Toner; Cathal Foy (0-02), Padraig Poland,Ronan McGrath; Liam Kerr, Eamonn Toner (0-01), Donal O’Hare (0-05, 0-05f). Subs used: Cillian Burns for C Murdock (HT) David McEntee for C Cox (HT), Ryan Treanor (0-01, 0-01f) for P Poland (39), Malachy McEvoy for L Kerr (39), Sean Murdock (0-01) for R McGrath (44), Peter Fegan for C Toner (62).